Throughout the Cold War period, Manila stood shoulder-to-shoulder with Washington, providing much-needed logistical support during the Korean and Vietnam wars while hosting the United States’ biggest overseas military bases in Subic and Clark. In the post-Cold War period, however, the Philippines has had to navigate a more fluid strategic landscape, with its leadership exploring new partnerships in an evolving regional order. After decades of strategic stupor, and amid growing worries over a resurgent China and a wobbly America, Japan has gradually transformed into a key security partner of the Philippines. Philippine President Benigno Aquino’s four-day state visit to Tokyo was one of both great historic and strategic significance. Throughout the 1990s, the Ramos administration (1992-1998) made a concerted effort to build the foundations of a more self-reliant Philippines, implementing the Armed Forces of the Philippines (AFP) Modernization Act and astutely utilizing multilateral diplomacy, under the aegis of the Association of Southeast Asian Nations (ASEAN), to push for greater regional integration as well as manage territorial disputes in the South China Sea. The exit of American bases in 1992 provided a strong impetus for Manila to revisit its U.S.-centric foreign policy. Though rising territorial tensions with China, especially during the 1995 Mischief Reef incident, forced the Philippines to seek a Visiting Forces Agreement (VFA) with the United States, the subsequent Arroyo administration (2001-2010) consciously adopted, especially in the mid-2000s, an equi-balancing strategy, which was responsible for an unprecedented, albeit short-lived, “golden age” in Sino-Philippine relations. Confronting an increasingly assertive Beijing, however, the administration of Benigno Aquino effectively dumped the equi-balancing strategy of the previous leadership in favor of a more overt tilt towards Washington, with Philippine Foreign Secretary Albert Del Rosario emerging as one of the most vocal proponents of a greater American military footprint in Asia. The problem, however, is that the Obama administration has repeatedly refused to openly declare — in clear juxtaposition to its stance over the Senkaku/Diaoyu dispute — any commitment to come to the Philippines’ rescue in an event of conflict with China over disputed features in the South China Sea. Eager to avoid any Thucydides trap, Washington has explicitly declared neutrality over sovereignty claims in the area, confining its interest to freedom of navigation — both for merchant fleets and American naval assets — in key sea lines of communications (SLOCs) such as the South China Sea. In short, Washington has refused to offer its military muscle as the Philippines’ deterrence against China’s maritime ambitions. Meanwhile, Japan, especially since 2011, has stepped up its strategic partnership with like-minded regional states such as the Philippines. It was, however, the return of Shinzo Abe to office in late-2012 that spawned a qualitative transformation in Japan’s posturing in the region in general and Japan-Philippine relations in particular. Along with Junichiro Koizumi, Abe is largely seen as Japan’s most charismatic leader in recent memory. Decisive, nationalistic, and ambitious, he has invested much of his political capital in upending Japan’s post-war foreign policy. But Abe’s efforts at carving out a new security role for Japan faces stiff opposition among pacifists at home as well as suspicious neighbors abroad, particularly China and South Korea. Operationally speaking, Abe’s call for “proactive pacifism” and “collective security,” anchored by the revised U.S.-Japan defense guidelines, cannot materialize unless Tokyo gains access to overseas bases that support far-flung military operations. 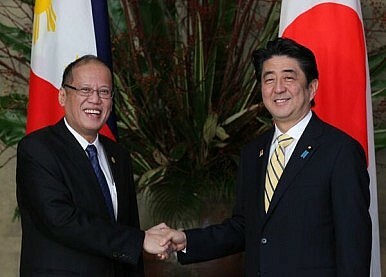 In a direct rebuke of growing anxieties over the alleged erosion of Japan’s pacifism, Aquino, before the joint session of the Japanese Parliament, chose to instead portray China as the regional aggressor, which has supposedly imperiled “the prosperity of maritime and coastal East and Southeast Asia.” Abe needs the Philippines’ diplomatic support, while Aquino needs Japan’s military muscle. It is a perfectly symbiotic relationship. The two leaders also discussed the potential export of advanced defense assets such as P-3C anti-submarine reconnaissance aircraft and radar technology to the Philippines. Additionally, under a $150 million deal financed by a Japanese soft loan, Tokyo is expected to deliver ten multirole patrol vessels to the Philippine Coast Guard. Manila also expressed its openness to a bilateral Visiting Force Agreement, which would allow Japanese Maritime Self Defense Forces to refuel and resupply in an event of joint patrols in the South China Sea. More than ever, the Philippines has come to rely on an external partner other than the United States. And China’s maritime assertiveness has gradually empowered its archrival Japan to reinvent its role in the region. Richard Javad Heydarian is an assistant professor in political science at De La Salle University, and a policy adviser at the Philippine House of Representatives. He has authored more than 400 articles and policy papers on Asian geopolitical affairs for a range of online and print publications. Japan, Philippines Strengthen Strategic PartnershipJapan Tank Landing Ship Set for Philippines VoyageThe Philippines' Approach to North KoreaContinuity Amid Uncertainty: Philippines-US Security Relations Under the Duterte-Trump AdministrationsA New Japan-Philippines Military Helicopter Deal?